Retinal implants, also known as a bionic eye are biomedical microchips designed to provide visual perception to people suffering from degenerative eye diseases such as retinitis pigmentosa and age-related macular degeneration and have lost vision. Globally, development of efficient and advance technology, rise in the awareness among people retinal implant, increasing government initiative across the globe, growing geriatric population and prevalence of degenerative conditions are the prime growth drivers of global retinal implant market. 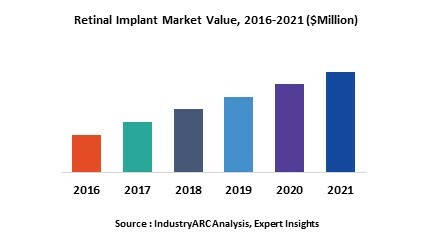 In addition, increase in adoption of retinal implant in emerging economies such as China, India and others, will create new opportunities for retinal implant market. However, higher cost of the research and development, risk of biocompatibility and long-term stability of the material used for devising retinal implants, complex nature of implant surgeries, lack of trained professionals, and higher cost of surgeries are the key restraints for retinal implant market. Geographically North America dominated retinal implant market because of advanced and well setup health care infrastructure, and technological advancement. Asia Pacific is projected to have fastest growth, owing to rapidly increasing aging population, increasing population of patients suffering from age-related macular degeneration (AMD) and retinitis pigmentosa (RP), rise in consumer awareness, favourable government policies, modernization of healthcare infrastructure, and growing medical tourism industry in developing nations such as China, and India in this region. Among all the device type, Implantable Miniature Telescope (IMT) has the highest market share in global retinal implant market. This report identifies the global retinal implant market size in for the year 2014-2016, and forecast of the same for year 2021. It also highlights the market drivers, restraints, growth indicators, challenges, and other key aspects with respect to global retinal implant market. 14.2. Second Sight Medical Products, Inc.
14.5. Bionic Eye Technologies, Inc.